The Food Stamps program for Missouri is costing the Federal government over one hundred million dollars per month and yet Food Stamp fraud is largely ignored. When hard working Missourians are paying taxes for these types of services, they want to believe that this money is being used appropriately. Unfortunately, this is not always the case. – Family Support Division “Report on Food Stamps and Temporary Assistance for Needy Families” (March 2011) showed that “30 cases were referred to the Prosecutor, 26 convictions and 2 restitutions involving $489,796.41 in claims.” According to the Department, nearly 16% of the Missouri population is on food stamps. Some items are ineligible for Food Stamp benefits: alcohol, tobacco, hot prepared foods, foods prepared for immediate consumption, vitamins, medicine, supplements, or non-food items such as paper products, soap, or pet food. It also states the “Food Stamp benefits cannot be withdrawn as cash”. This report may seem like only a small portion of fraud is occurring; however, most fraud is undetectable because of how the current system is setup. By law food stamp card users cannot be asked by any business for identification to prove they are the card owner. A person can purchase a food stamp card through the black market for half its value, receive the pin number, and use the card to purchase groceries (According to testimony in the House Committee on Children and Families). I sponsored House Bill 1903, which I believe will go a long way towards fixing the fraud problems in the food stamp program. This bill simply places a photo on the food stamp card and require it be checked when purchases are made. This way, food stamp fraud will be much easier to catch. The total income of a household is divided up to all members in a household. Since immigrants are not eligible for the food stamp program government actually reduces the amount of income the household earns. 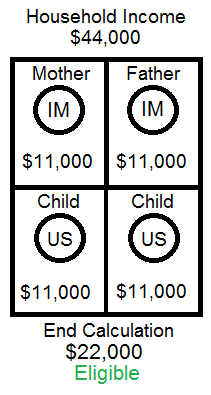 The household income is divided to all the occupants and then added together. 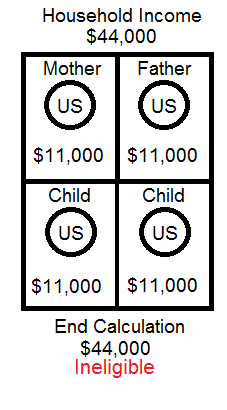 If there are immigrants in the household, their portion is not included in the final total. Here is how it works. In an ‘all US household’ making $44,000, they would be well above the 130% poverty line, making the household ineligible for the food stamp program. In a half US citizen and half Immigrant Household, the income may be the same but since the portion ofimmigrants are not included towards the qualification of food stamps, the household can be eligible at much higher incomes. There is no reason that an immigrant family should have an advantage over United States families. If all states implemented a qualification system that treats all families the same, the Federal government could see a savings of over $400 million dollars. This is why I support House Bill 1882.